Includes features from a variety of contextual menus. Is there a better alternative to Amelita? Is Amelita really the best app in Desktop category? Will Amelita work good on macOS 10.13.4? Amelita needs a rating. Be the first to rate this app and get the discussion started! 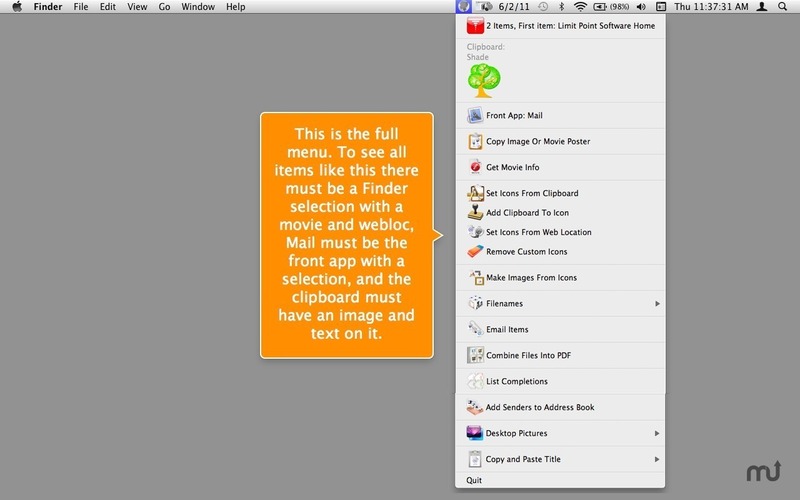 Amelita is a menu-bar app consisting of many utilities whose features are listed below. The features of this app are mostly a consolidation of the features in our various contextual menus wriiten for earlier versions of Mac OS, but no longer supported on OS X 10.6 and above. And some features are borrowed from our other apps. Note that features are contextual, and will display only if they are applicable. For example, "Copy Image or Movie Poster" will only display if the Finder selection contains at least one image or movie file. "Set Icons From Clipboard" will display only if the clipboard has an image on it. And "Add Senders to Address Book" will display when the frontmost app is Mail and it has a message selection. Finally, although some features can be performed in other ways (i.e., "manually"), occasionally the objective is to simplify it. Even if a multi-step repetitive process can be shortened by one step, a workflow can be significantly more productive. Add the senders of selected messages in Mail to a new group in Address Book. The group name is of form "Amelita [current date-time]"